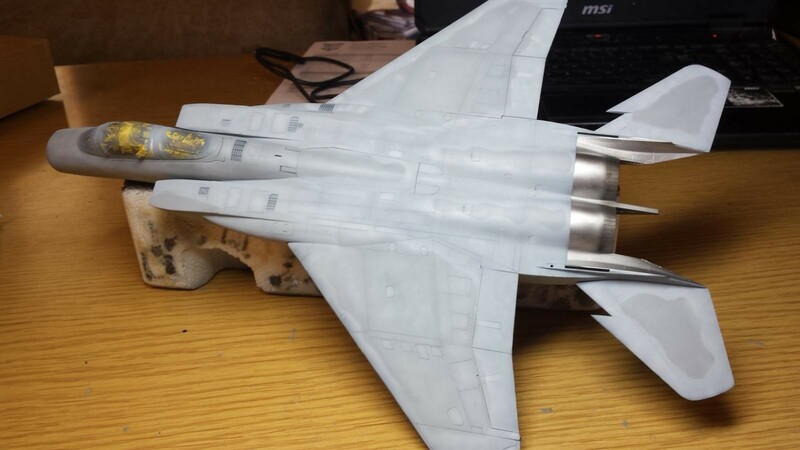 Well just completed a lot of masking today on the F-15 project. 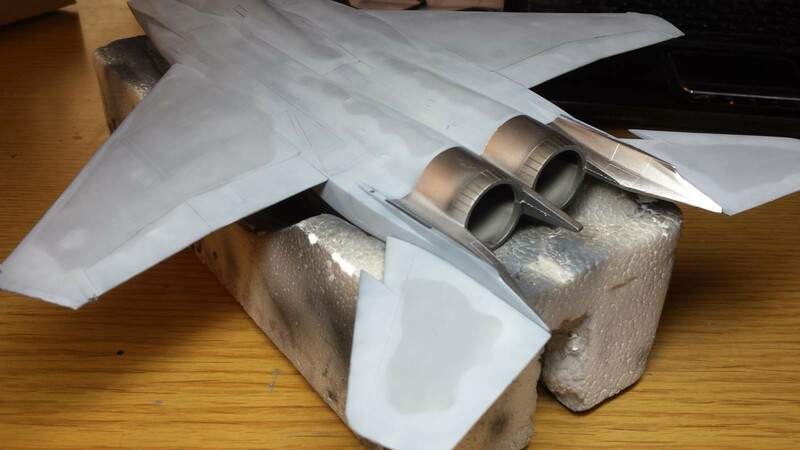 This was done in order to paint the metal finish on the top/bottom rear fuselage near the jet exhausts. 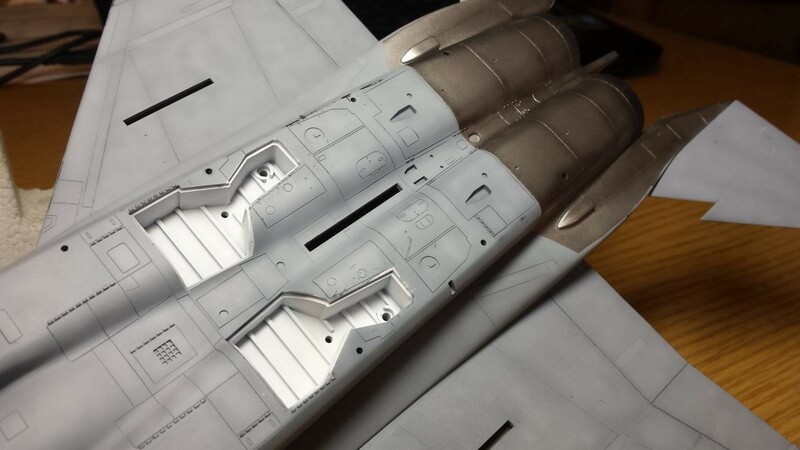 I also needed to mask the fuselage around the wheel wells in order to spray them gloss-white. To make the mask for the wheel wells I simply placed blue masking tape over the wheel well openings. Make sure it was nice and tight. Then I used a pencil to trace the outline of the well openings onto the masking tape. Peel off this tape and place on table. Use X-Acto to cut the outline out of tape. 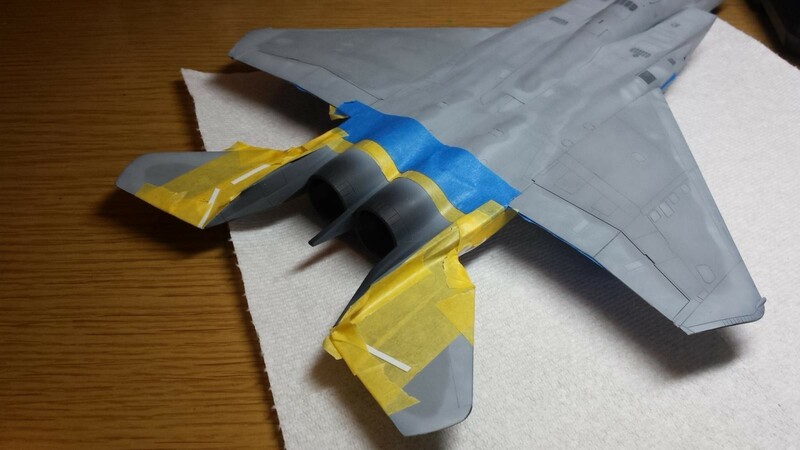 Then put tape back onto fuselage. This provided a perfect mask w/o a lot of different pieces, cuts, and frustration. BTW I hate to mask so always looking for better ways to accomplish this. I pictures show the results. Very minor touch up needed but close to perfect. While the white acrylic was still in the airbrush I painted the wheel hubs and landing gears gloss white. I used Tamiya white. I love the performance of this paint with my airbrush. The tires were already painted black so I used a plastic circle template to paint the rims white. I love using this trick. It works every time. Saves me hours on painting wheels properly, especially for multiple road wheels with armor vehicles. 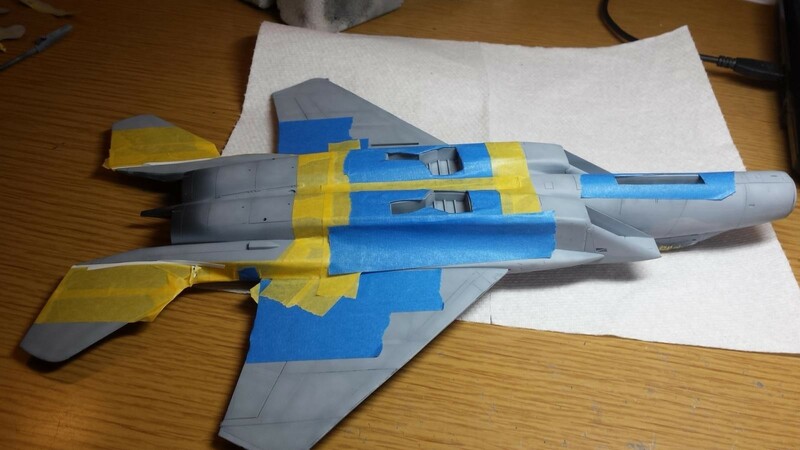 After masking the fuselage off from the exhaust sections top/bottom I airbrushed Vallejo Metal Colors Acrylics Dur-Aluminium. I was very happy with the initial results and appearance. I did not need to do any fancy prep-work before spraying the NMF over the base paint. 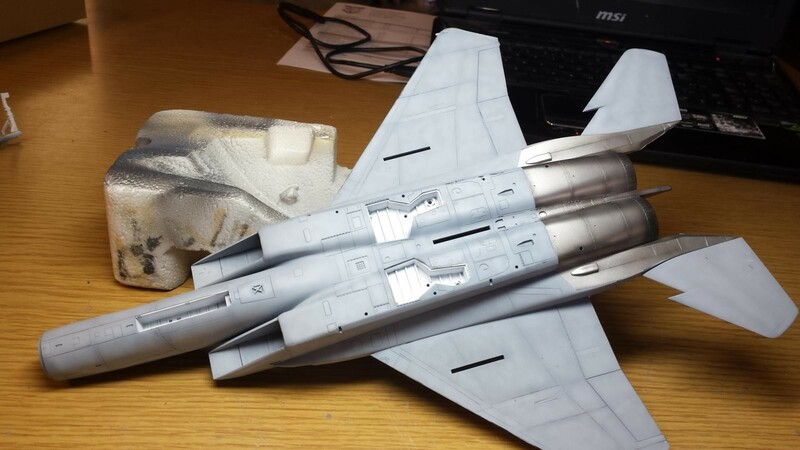 There is a small blemish on the top but this is due to me resting model upside down on desk prior to paint drying…aggg! I cannot speak highly enough about this line of Vallejo Natural Metal paints. They are very easy to use, always look good, and if applied properly over a clean, primed/painted surface they do not peel up after it is masked. I was even able to sand the finish smooth after it was dried (15 mins) to repaint b/c I needed to fix a mistake I made with some pre-shading. I never tried to use these paints over bare plastic b/c in general I have had problems applying any acrylic paint over bare plastic. It sometimes rubs or peels off. After this initial coat I mixed in a little black to the Vallejo NMF paint. This is were problems happen. I had trouble shading the exhaust area panel lines with this darkened NMF mix due to it clogging up my airbrush really bad. 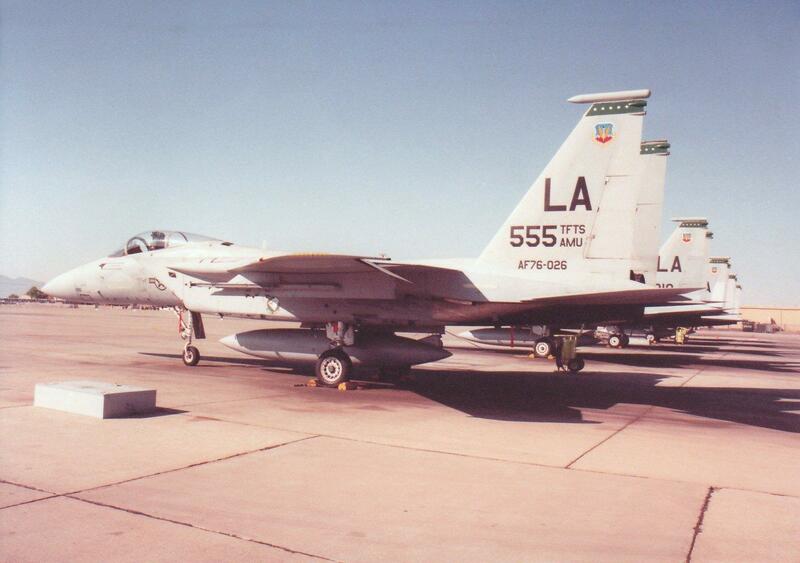 This is not the Vallejo NMF paints. It is the AK Interactive Matte Black Acrylic I used to darken it. 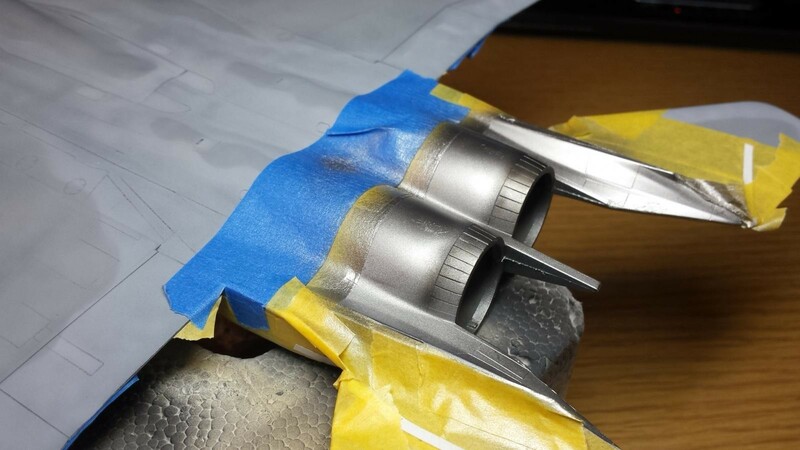 I have had extreme difficulty spraying this paint with my airbrushes all the time. I also have the same issue with the AK Interactive Black Primer. No matter how thin I spray it the paint clogs severely and I need to break down the whole brush to clean out the gunk. So this was a stupid mistake on my part forgetting this issue. I sanded down the awful pre-shading attempt and repainted the NMF. I then used very thinned Tamiya Flat Black alone to airbrush dark panel lines over the NMF. This black always works perfectly. 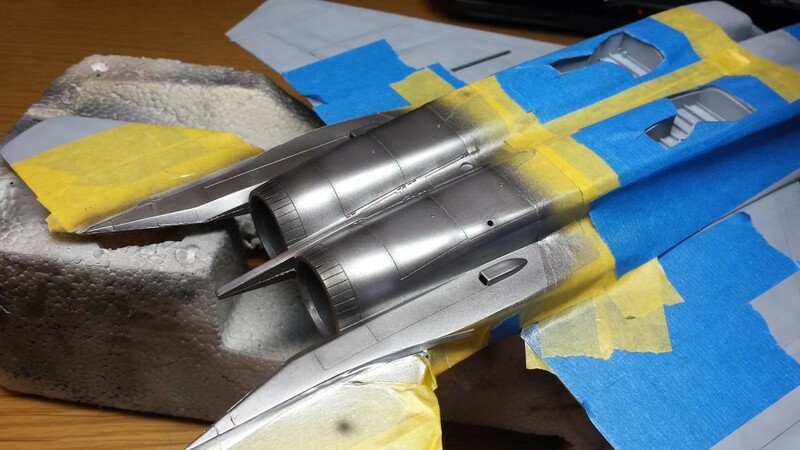 Finally I toned down the effect of pre-shade by misting a light coat of the Vallejo Metal Paint over it. I was them happy with the results. The above steps occupied most of the day and now it’s time for a break. I would like to gloss coat the entire fuselage with clear gloss Future Floor Wax before the day is done. This will give it time to cure so I can begin to apply decals tomorrow. I finally feel like I am on the home stretch, although I have not even begin the process to build and paint the weapons. Stay Tuned for More! Just wondering if we’re seeing the demise of WiP Group posts. More and more, I’ve noticed direct posts into Headlines for ongoing projects. Still looking very good, I’m gonna stay tune for the next episode.